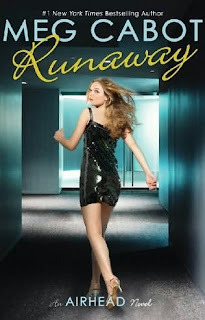 Today is the release day for Runaway , the final book in the Airhead trilogy by the always fabulous Meg Cabot! Em Watts is still stuck being Nikki Howard, but she is getting closer to discovering the reason why her brain was transplanted into Nikki's body...because the real Nikki is alive, and she knows everything. The only problem is, she's quite unwilling to talk unless she gets what she wants--her own body back. Em needs Christopher's help if they are going to discover the reason behind Stark's secret themselves, but unfortunately Christopher isn't exactly happy with Em right now. With everyone wanting so much from her and her sort of boyfriend hating her, is it really any wonder that Em feels like running away? Runaway, the conclusion to the Airhead trilogy, is a snappy and smart read that goes by far too quickly! The novel picks up only days after the tension-filled conclusion of Being Nikki, and dives into the action right away, with all of the drama surrounding Brandon Stark's attempt at whisking Em and the Howards away to his summer home. They are quickly rescued, but when they return to New York, it is evident that they aren't any safer there. Lulu and Gabriel Luna quickly join the group as Em and Christopher attempt to get to the bottom of the mystery through a series of fast paced action scenes, complete with plenty of quick thinking, computer hacking, and romantic tension. Meanwhile, plenty is happening with the large cast of supporting characters--people a hooking up, breaking up, and making up. Nikki, who comes off as horribly vain and shallow throughout most of the series, gets a makeover and a drive for revenge, making her more likable and more ruthless. Em is dealing with her own issues concerning her mother and how she taught Em and her sister to perceive beauty, which adds a bit more depth to the plot. Cabot gives readers hints at Stark's insidious plan throughout the book, which may be predictable to some readers, but not any less surprising or suspenseful once all is revealed--including the true reason behind Em's brain transplant. But even after the big reveal, Em must work fast to outsmart Stark and see that justice is served. Finally, the book culminates in a highly satisfying confrontation readers have been looking forward to since Airhead. In her trademark style, Cabot proves once again that being smart and being fashionable don't have to be mutually exclusive and that by being yourself, no matter how hard it may be, you will always come out on top. Cover Comment: I think the model's position looks a little awkward, but I really like that she is in the act of running away. I've always found the design of the Airhead covers pretty neat, and I just love how the same model has been used for all three books. Very neat cover!